Today is "Giveaway Day" at SewMamaSew! 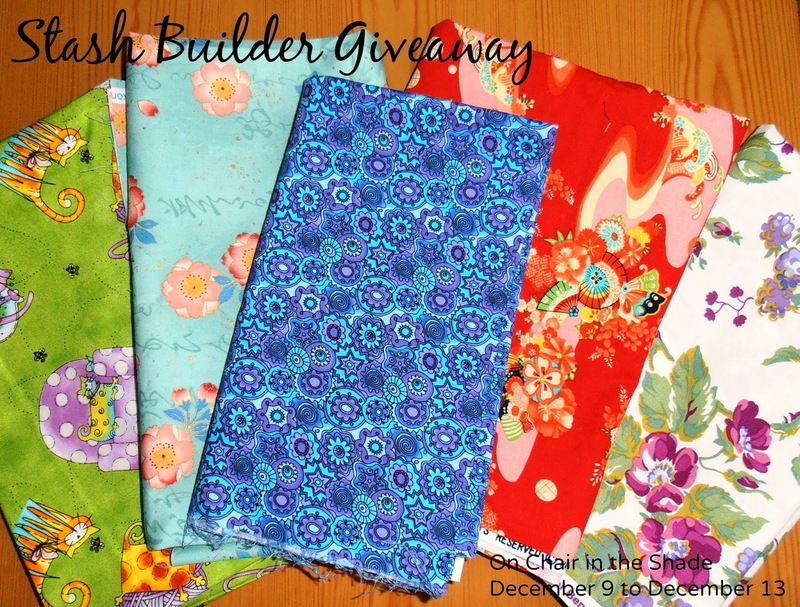 Currently there's over 100 blogs linking up giving away fabric, supplies, patterns, and finished projects. 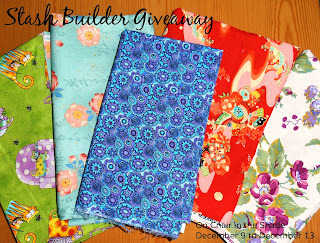 I'm joining in and giving away five half yard pieces of different fabrics to build you stash. This giveaway is open internationally. Just enter using the rafflecopter form below. Only the first option is mandatory, but you can follow me on Pinterest or Bloglovin for additional chances to win. But, first, let me show you what you're going to win. 1. A red piece from Michael Miller featuring fans, flowers, and butterflies. 2. A pale turquoise piece from Kona Bay featuring lotus flowers and a sort of Japanese handwriting. 3. From Benatrex, a floral piece that appears o be berry blossoms and some berries. Cream background, with greens and burgundies. 4. From Studio Fabrics, lime green fabric with obese cats lounging in chairs, playing with yarn and chasing butterflies and bees. 5. From Blank Quilting, a blue and purple piece with an abstract design. Winners will be notified by December 15. And by the way, I'm giving away a Six Pattern Bundle. You can win patterns to sew your own skirts, dresses, and purses. So click on over and enter that giveaway too! This giveaway has ended now, but you can enter to win this week's giveaway: Two Handmade Zipper Pouches. I love making baby quilts! Thanks! I most like to sew ... Variety. I like to try new ideas. But I do have a simple blouse pattern that enjoy making in different fabrics. Lap quilts..thanks for the sweet giveaway! I love to sew lap size quilts too. But my favorite is the challenge of using scraps. Thanks for the fun giveaway! I love using scraps too as I hate to see waste. I'm learning to quilt so that is what I'm obsessed with right now. I started off sewing purses and although I love making quilts they are still my favorite. i like sewing things that make life easier! I enjoy making lap quilts & baby quilts. Thanks. I love making table toppers - thanks for a great giveaway! Quilts! Thanks for the giveaway! I ♥ making bags and pillows, best wishes from Argentina! I like making bags and wallets. Anything! I enjoy the process and accomplishment of making. Love the colors...lots of possibilities! Thanks for the drawing! My favorite thing to sew is (currently) quilts. I have been sewing for 40 years and have probably made everything there is to make with sewing. so I love it all. But quilts are my current "making the memory" item for my family! Quilts, quilts and quilts, a pillow now and then. Thanks for the chance! Quilts, bags, baskets, home dec & mixed media. By the way, Pinterest is down this evening. I have just discovered quilting and I love it! I make quilts of all sizes. right now, it's paper piecing quilts. clothing! Thanks for the chance to win! I enjoy making quilts. I want to learn how to put in zippers so I can make pouches. I love sewing baby and kids clothes. Thanks! I really enjoy making table runners and quilts - as gifts. Have yet to make one for myself. I love to sew quilts and pillow covers! I love sewing children's clothing. HI, QUILTING PROJECTS; ESPECIALLY TABLE RUNNERS+PLACE MATS! My favorite think to sew is quilts. Things for my kids - capes, toys, quilts, hats. I love sewing bags at the moment :) Thanks for the chance to win! I love to make quilts! Thanks! I love to make quilts. I am starting to make new things but quilts will always be a love affair. I love to make purses and wallets. Quilts. But that is followed by a close second of alterations - I know, quirky but I love making something that fits from a item 4 sizes to big for me. I make quilts - bed sized usually. Thanks for the chance to win! Quilts and cloths for my daughter. I love to sew table runners, lap quilts, baby quilts, and wall hangings!! My favorite thing to make is small quilts, but I would love to be good at making big ones! I love sewing small projects - ones that take one or two evenings or a Saturday - things I feel I can accomplish and DO! I do love making quilts but I set it aside and get sidetracked by other things and struggle to get back to it! I love making quilts and bags. Right now I like smaller projects like table runners, placemats, & mug rugs so I can practice my free motion quilting skills. Anything for my baby girl! Love making Quilts, Totes, & doll clothes for Grangirlie's babies. I love making handbags. I can't stop! I like small projects, like pillows and runners. At the moment I'm loving English paper piecing. I love to sew lap sized quilts! Sewing clothes for my little princess. Awesome giveaway hope I win, Thanks!! I like bags a lot. Right now I'm making pet harnesses. I love making apparel, dresses and skirts! Everything! I love to sew! I love sewing quilts! Any size and kind! hmm my favorite thing to sew.... maybe bags they are fun and quick! My favourite things to sew are baby dresses. I like making quilts. Thanks for chance to win. New to sewing, my favorite thing to sew so far is pillows! I like to make zipper pouches. I love to make wall hangings. I love sewing zippered pouches. I love to sew quilts and apparel! I just love to sew. I enjoy making gifts for my family and friends. Thanks for the chance to win. I love to sew baby clothes. My very favorite thing to sew is costumes... where you get to be a bit creative. Quilts!! thanks for the chance to win! scrap quilts and stuff for my grand baby! I love table runners, mug rugs and bags - quick results are gratifying with other long term projects still coming. I'm new to sewing but rapidly becoming addicted to quilts. I sew quilts, quilts and more quilts! And anything in the quilty realm. I love to make scrap quilts! I love to sew scrappy quilts! My favorite thing to sew is scrappy quilt blocks. I always make a block, but I never actually put them together lol. I love to make bags, thanks for a great giveaway. Quilts for family and friends, and charity quilts for those I don't know! Quilts or table runners. I don't garment sew. I love to sew anything! I really like making pouches and totes. I enjoy making quilts and table runners, but my very favorite item to make are unusual potholders. Baby quilts and table runners. Small and quick projects that I actually finish,lol. Quilts...or when I need something faster, a bag! Fabulous fabric! I'd love to use them in a quilt. I love to sew clothing for my daughter. I am a quilter, but lately I've been getting more and more in to clothes and bags! My favorite thing to sew is dresses for my little one and her doll.